Male riders still dominate the scene making up 92% of the British biking public, with most bikers being aged 40 years old and over. However, sports tourer styled bikes (18.5%) remain the market favourite followed by naked (16.3%) and adventure (14%). 33% of bikers are riding daily, but all-in-all 80% of bikers ride at least once a week. Find out more about the UK biking population on our interactive map! 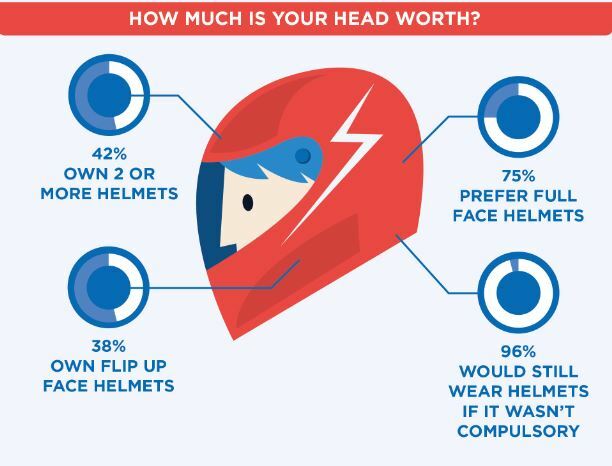 Almost half of bikers surveyed owned two or more motorcycle helmets, in different styles including flip face, but 75% still preferred the full face option. The big question asked was ‘would you still wear a helmet if it wasn’t compulsory?’. It was no surprise to see that 96% of motorcyclists would continue wearing a crash helmet, and they also viewed gloves (90%) as another must-have safety accessory that should become compulsory by law to wear. 38% of bikers will opt for a black helmet followed by white (23%) with the average price paid being no more than £300. 55% of bikers are aware of the SHARP helmet scheme, however 56% don’t know how many stars their helmet has been awarded. Still, SHARP does play an important factor in the purchasing process for bikers, 38% of the 1,500 surveyed said they have bought a helmet based on its SHARP rating. Comfort, price and manufacturer were also taken into consideration at the time of purchase. In terms of manufacturer, Shoei (25%) and Shark (20%) stood out as the market favourites. It’s clear that bikers a conscious of what they’re putting on their heads but are also savvy shoppers too. 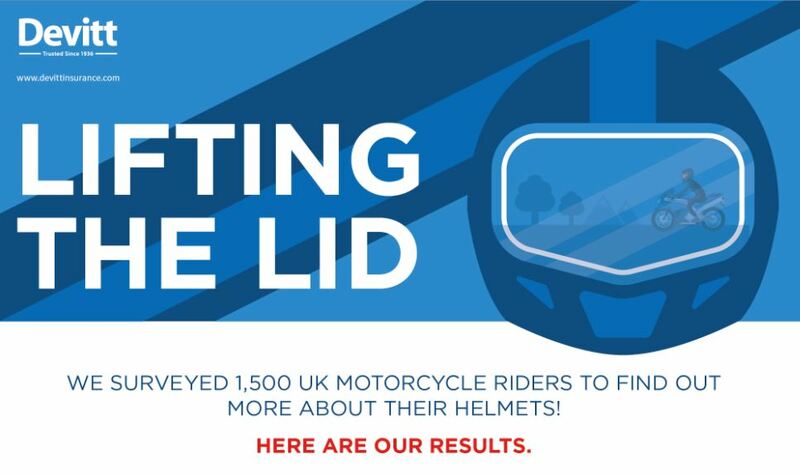 With the life span of a crash helmet only being 4 years (this only applies to those helmets that have never been dropped, knocked or bashed in any form), 75% would replace their lid at 5 years maximum, if not sooner! You can find out more about helmet safety in our dedicated guide. Take a look at the full infographic now!